After a week working at my full time job at Outward Bound I got a call from Vertical Descents to guide a couple of canyon trips at Inchree. 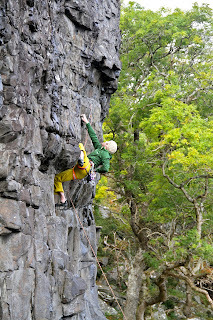 Having recently passed the Canyon Guide level 1 assessment, it was a great opportunity to put it to good use. Canyoning is probably my favourite activity to undertake with groups, as it turns the outdoors into a giant playground where you just have a great laugh and scare yourself a wee bit with some of the bigger jumps around. Inchree is a fantastic canyon with very little rope work which means very little waiting around and a great flow to the day. 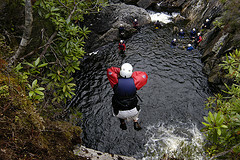 There are some excellent slides, jumps, zip wire and it all culminates with an 8.5m jump into a deep pool. Fantastic fun!! For more info on canyon trips contact me via email. 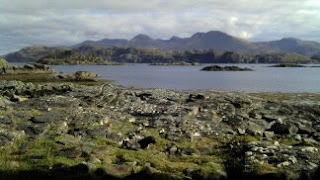 Sunday was a bit more chilled with a trip out to Black Crag by Lochailort. This crag was bolted a few years ago by Tom Bollard and and is a nice wee day out with grades from F5+ - F7b+. The crag is situated by the sea so discretion/common sense is advised regarding the bolts and lower offs. The setting far exceeds the climbing in my opinion but the setting is so stunning on a beautiful day that it makes the trip worthwhile. You can extend your stay with a night in the Fisherman's bothy a little further along the coast. Up there with one of my favourite places that I've ever stayed. The day was spent with Karen, Sarah, Dot and Berry. Beautiful setting, beautiful weather, beautiful company and a wee bit of bolt clipping thrown in. A great finish to the week.